An homage to the classic French bistro featuring over fifty-five recipes from the Paul Bert in Paris and a dozen of the best bistros in the French capital. The French bistro provides an irresistible dining experience, combining fresh, traditional dishes with a friendly atmosphere. With its checkered tablecloths, chalkboard menus brandishing the plats du jour, emblematic wooden chairs, and an endless supply of crusty baguettes, the gastronomic bistro has firmly established itself as a culinary institution. Bertrand Auboyneau, owner of the Paul Bert in Paris, offers a seasonal selection of over fifty-five hearty recipes. Starters include Country Pate with Pickled Chanterelles and Anchovy Fillets with Marinated Red Bell Peppers. An extensive selection of main courses ranges from Milk-Fed Lamb and Baby Vegetable Pot Roast; Fattened Hen in Jura Vin Jaune and Homemade Mashed Potatoes; and Duck Breast with Morello Cherries and Roasted Baby Potatoes; to Entrecote with Bearnaise Sauce and French Fries. After a whiff of a dazzling cheese tray, if you still have room for dessert, you can indulge in an assortment of delicious classics, such as the Paul Bert's signature Paris-Brest, praline cream in a crisp choux pastry ring; Tarte Tatin; a heavenly Chocolate Souffle; or a glistening Rum Baba, brimming with vanilla-scented Chantilly cream. 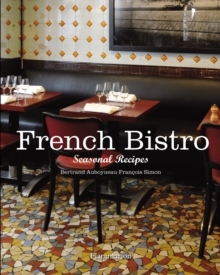 To accompany the recipes, revered food critic Francois Simon outlines ten essentials for a true bistro, such as the importance of an inspirational owner, a highly experienced chef, impeccable servers, and the art of creating an authentic decor, dense with the wafting aromas of good food and wine. Photographs feature both recipes and the lively spirit of a dozen Parisian bistros.